There are critics and cynics who are having a good time roasting Twitter. They see Twitter as a site where people wildly shout out trivia about their boring lives hoping that someone is listening. Well that is happening certainly for some twitterers, like in most social media. It’s kind of amusing in a sad way. Yet there’s no denying the real value under the surface of Twitter. There are people sharing important information and ideas. There are experts offering guidance. There are potential customers talking about what they really want to see in products. The Twitter population is huge and growing. Some chunk of it though is boring everyone to death where they are sharing such mundane details as the dressing served at lunch today. However, a substantial population are sharing about more exciting things. The recent Twitter “revolution” in that brought thousands of people to the streets of Romania to protest is just one case in point. If you’re one with the cynics and critics and you’re not part of Twitter, maybe it’s time to rethink your position. Become a part of this exciting collection of social networks. And I promise: You won’t be forced to share your lunch stories with anyone. You will find there’s just so much more real value in Twitter than that. Honest. 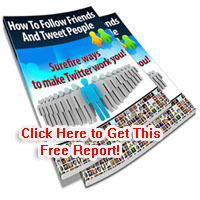 There are secrets of Twitter in marketing that you need to find out more.